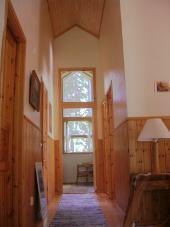 The house is situated in beautiful woodlands with lots of blueberries, lingonberries and mushrooms. There is a great wildlife with elks, deer and both forest and sea birds. Along syrsaviken you can walk on pathways and you find rocks where you can swim and sunbathe. In the area there is a boat with outboard motor and a swedish "snipa" for hire. You can also loan a rowboat. Fishing with spinning rod is free. In the bay there are plenty of pike, perch, whitefish and herring. 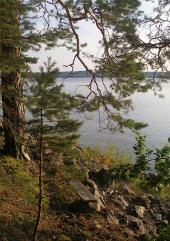 Fishing for espicially pike in Tjust archipelago is very popular. Many fishing competitions are organized in the area, for example the European Championships in pike fishing. The fishing season of pike stretches all year around, but the best periods are March-May and September-November. We practice "Catch & release" in pikefishing. It is 12 km to the nearest town Loftahammar, there is a grocery, bakery and cafe, gas station, marina, church and cultural activities. There is also a 9-hole golf course in beautiful park and woodland terrain. It features complete practice area with putting green. There are ferries that operate throughout the whole Västervik archipelago with regular tours, opportunities for day trips to different islands with a lot more. It's about 55 km to the beautiful coast city of Västervik. 80 km away is Astrid Lindgren's World. Kolmården zoo is located at 90 km away.